(MARINA) Today we made Runzas, a great winter dinner or lunch. My first Runza was at a Nebraska football game this past August. That’s where my mom went to college. Runzas are a big deal in Nebraska. Here we are, at the game, eating Runzas! Runzas start with dough. 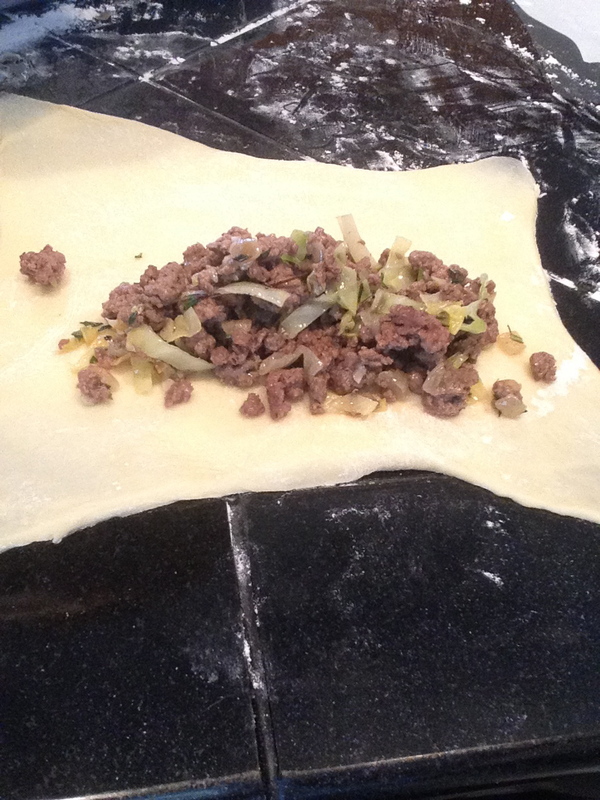 We roll it out into a rectangle, then we make little flaps on each corner of the dough. Put in the meat, fold the dough over and seal the flaps. Pop it in the oven and mmmmmm! My fave part of making Runzas is rolling the dough out (and eating it!). I also like to bite into it when the meat is still steaming hot. Hope you make yourself a Runza!!! (KERI) Let’s all just take a few minutes and laugh, laugh, laugh at the name Runza. It’s funny. My brother likes to make all sorts of jokes about how a Runza might give him the….yes, you get it. And you thought of it, admit it. Now that we’ve composed ourselves and dried the laugh-tears from our eyes, we can discuss seriously these soft pillows that are stuffed with meat and cabbage: Runzas are the epitome of comfort food and somewhat of a mascot for the state of Nebraska. Runza is a fast-food joint that has been selling these savory hand pies since 1949, mostly throughout Nebraska but a few in Kansas and one in Colorado. The Runza was introduced to the midwest by German-Russian immigrants who know how to make something delicious out of dough, cabbage, onion, and ground beef. The Runza tastes like the most OMG amazing morsel when you’re a college kid sitting in Memorial Stadium, singing ‘Go Big Red’ after a beer…or five. When I was that kid – many, many years ago – the Runza Dude would roam the stands yelling, ‘Ruuuuuuunnnza here, get your Runnnzzzaa.’ (Insert joke here – sure why not). Runza Dude would throw your Runza to you, you’d unwrap it, and place your dollars in the empty wrapper, then throw it back to Runza Dude. Good times. This past fall, I took my family on a pilgrimage to the Cornhusker state. I hadn’t been in 20 years and my Bite One and Daddy Bite had never been to Nebraska or a football game. Of any kind. Ever. 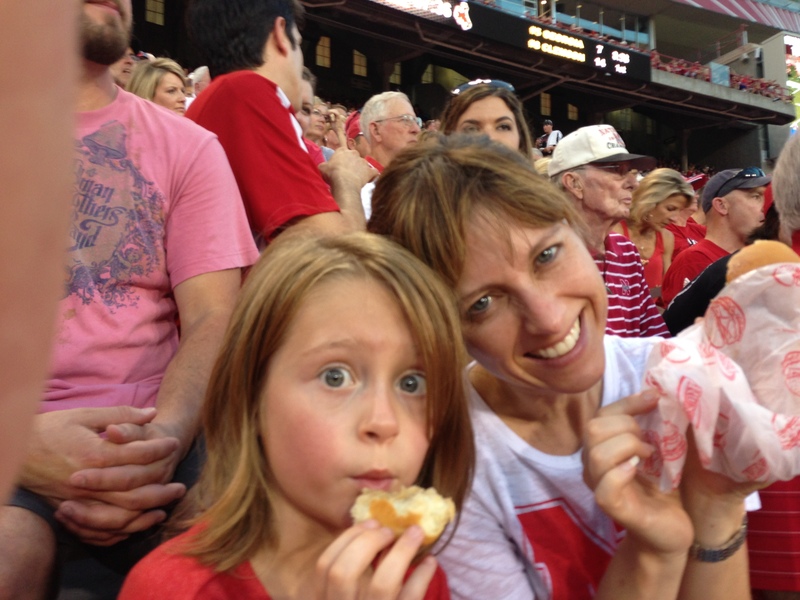 The highlight was, of course, the Husker game, and highlight #2 may have been the Runzas we ate at the game. And on the trip home in North Platte. Recall that Daddy Bite is Russian, and the Runza reminded him of his homeland’s piroshki. So how funny and coincidental was it to open my latest edition of the Food Network Magazine a few weeks after our trip to find a recipe for NEBRASKA RUNZAS! No kidding. I had to try it. I wasn’t sorry. It’s even better than the actual fast-grab Runza I ate after a beer. Or five. Way back when. 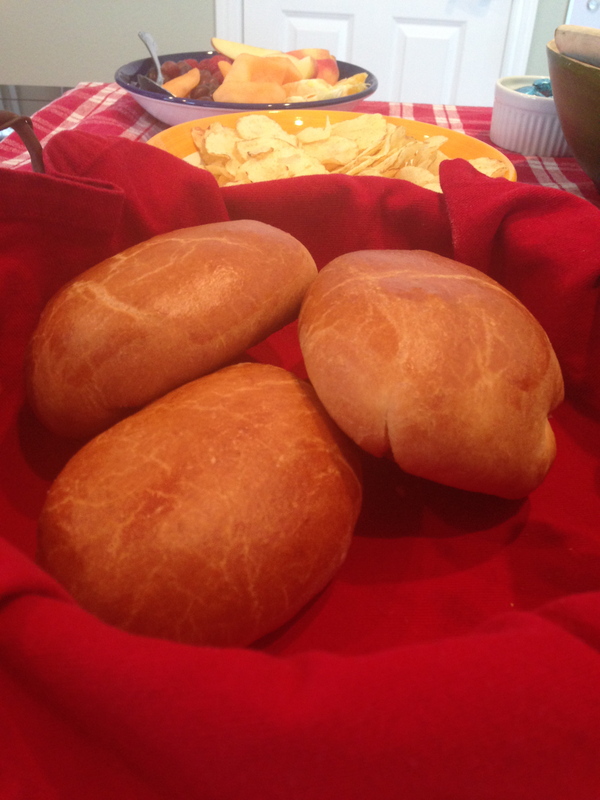 These homemade Runzas are divine. It’s like going home, no matter where home is for you. Make the dough then refrigerate it overnight to break up the steps. It’s worth the investment of time. This recipe called for spinach instead of cabbage. I can’t imagine it, so I took it back to its roots. The only two tiny gripes I might file with this recipe is that 1. the Runza is a little dry and 2. it could benefit from a small kick. Just an underscore of heat. 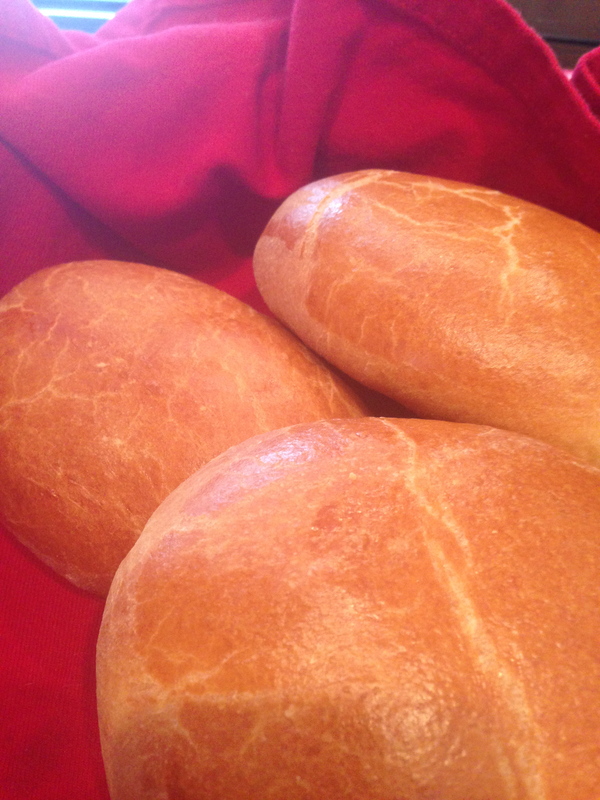 For moisture, you could add cheese, though that would be unethical: traditional Runzas don’t include cheese. I’d simply put a small pat of butter on top of the filling before rolling and sealing the pillow. For heat, I’d stir in a 1/2 teaspoon of red pepper flakes to the filling. Otherwise, these turned out en point. They would be the most outstanding centerpiece for your Super Bowl party. Oh, do that, please? Make Runzas. Take a trip to Huskerville with me, or wherever those sweet early adulthood memories are for you. Combine 3/4 cup warm water (approximately 110 degrees F),the yeast and a pinch of sugar in a large mixing bowl and let sit until foamy, about 10 minutes. Add 3 eggs and whisk to combine. Add half of the bread flour and beat with a wooden spoon until good and thready, about 3 minutes. Add the butter, the remaining 3 tablespoons sugar, the remaining flour and the salt and mix well. The dough will be a little sticky. Let rest 15 minutes. Knead the dough to develop the gluten until it feels tight and smooth, about 5 minutes. Transfer the dough to a lightly buttered bowl, cover and let it rise for 1 hour at room temperature. Then chill in the refrigerator,1 to 2 hours or overnight. Remove the dough from the refrigerator and divide it into 8 even portions. Roll each one into a ball and leave on the counter, covered loosely, to warm up, about 30 minutes. Meanwhile, make the filling: Heat a large skillet over medium-high heat. Add the onion and cook until light golden brown, about 15 minutes. 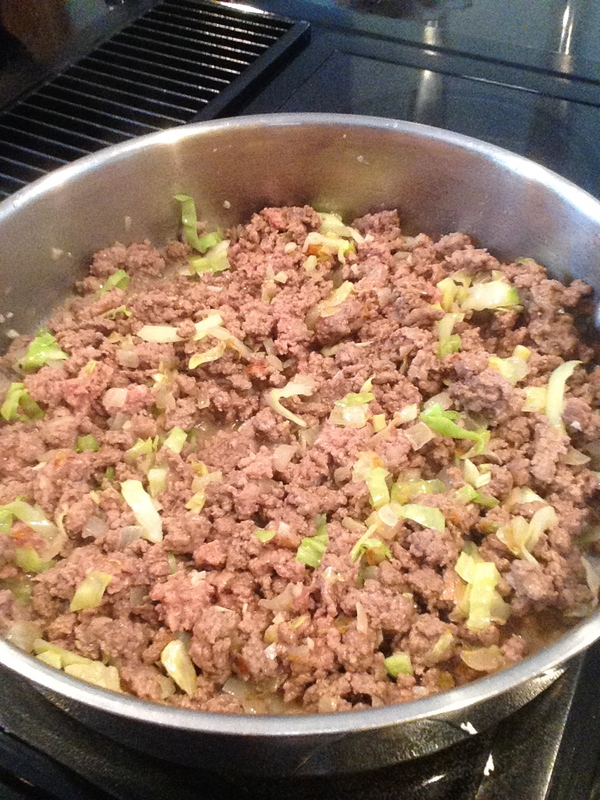 Add garlic, cook for another minute, then add cabbage and cook for another 3-5 minutes until soft. Stir in beef, breaking it up and cooking until the beef is no longer pink. Add 2 teaspoons of salt and 1 teaspoon of pepper, the thyme, rosemary and, if you wish, stir in 1/2 teaspoon of crushed red pepper flakes. Roll out the dough: Flatten a dough ball on a heavily floured surface and roll out into a 3-by-5-inch rectangle. Then make wrapping flaps from the four corners of the rectangle by rolling out each corner thinly so you have a thick rectangle with four thinner triangular wings at the corners. Fill the Runzas: Spoon 1/2 cup of the beef filling into the center of the dough rectangle, top with 1/2 pat of unsalted butter and wrap the flaps over it, pinching to close. Flip the bundle over in your hands, gently forming the Runza into a fat football shape. Set the runza seam-side down on an oiled baking sheet. Repeat with the remaining filling and dough balls, arranging them on 2 oiled baking sheets. 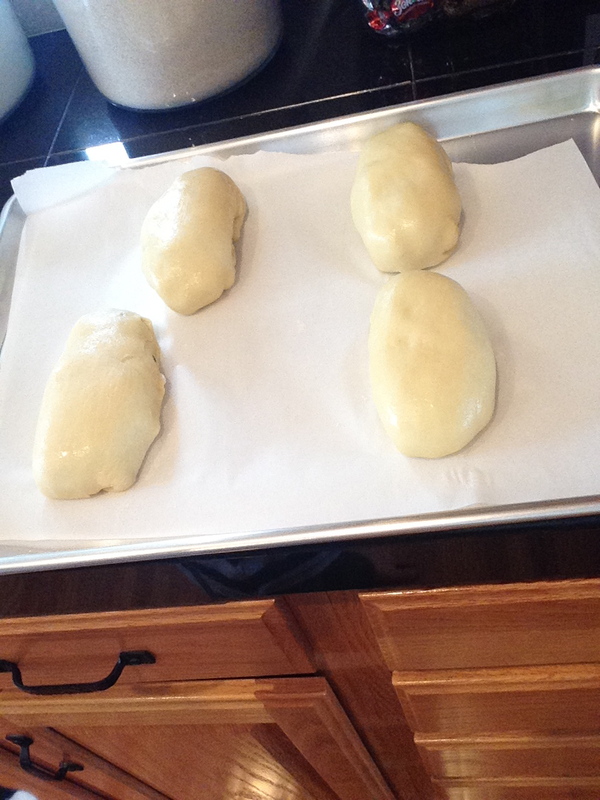 Let the runzas rise about an inch, uncovered, about 45 minutes. Meanwhile, preheat the oven to 375 degrees F.
Whisk the remaining egg and 2 tablespoons water to make an egg wash and brush it thinly over the tops of the runzas. Bake until golden brown, 25 minutes. Serve warm. This entry was posted in Main Dishes and tagged Cornhusker Football, Nebraska, Runza. Bookmark the permalink.